Boasting over 100 million subscribers, Amazon Prime is arguably the most prevalent subscription service in the history of mankind. But it didn't get that way just by offering compelling TV shows and free shipping on competitive products. Amazon Prime has held a league of its own, despite a litany of companies nipping at its heels. 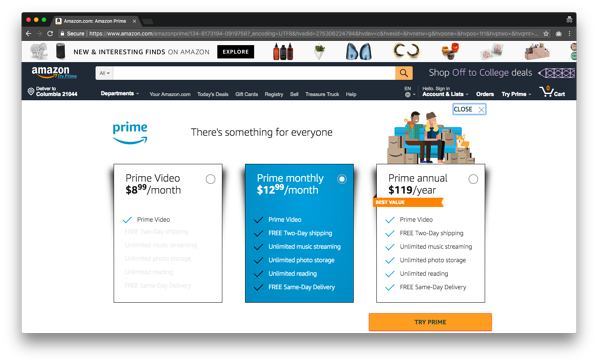 In this week's Pricing Page Teardown, we look at how Prime centers on what otherwise looks like two contradicting pricing principles: simplicity in pricing and segmentation in pricing. Amazon's historically simple pricing structure has created enough brand loyalty and value proposition to set the company up for pricing segmentation in the future. 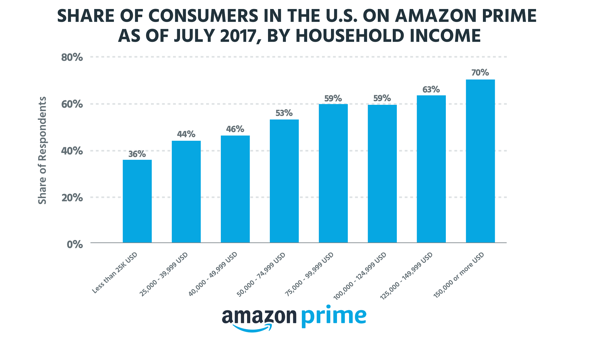 Amazon's customer base has accepted two price hikes in the last four years: In 2014, membership went from $7.99 to $9.99 per month; recently, there was an increase from $9.99 to $12.99 per month (approximately $99 to $120 per year), in exchange for a variety of different features, including video and music streaming, two-day shipping, and two-hour Whole Foods delivery. As the generally positive reaction to the price increase shows, Amazon has had great success with their digital Costco-esque service setup. In line with the classic Amazon model, Prime's success in remaining competitive has come at the expense of larger profit margins (aside from the highly profitable Amazon Mechanical Turk and a handful of other products, that is). By focusing on creating customer loyalty to Prime benefits early on rather than turning a buck, Amazon has created an environment with greater long-term price-increase tolerance. After all, two-day shipping aims to get you to buy more, and Prime video hopes to entice you to pay to watch “nonfree” content. Amazon demonstrates that there's nothing to fear when it comes to price increases, as long as companies do the legwork at the beginning to understand what it is customers care about and then set them up to see the value in paying a higher price. 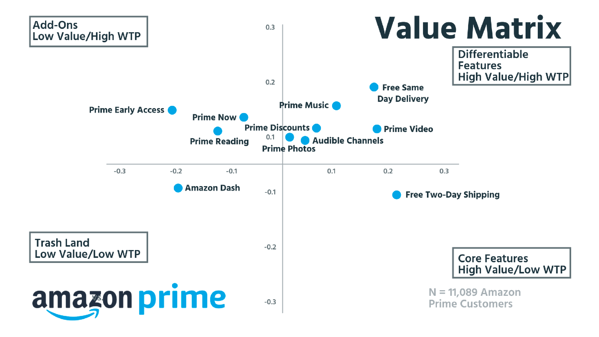 Based on data we collected from more than 11k Amazon Prime customers, it's obvious that streaming was a really, really good move on Amazon's part: It ranks as the highest-valued product offered. Of course, shipping follows close behind as Prime's flagship benefit. Streaming is the perfect example of what will make Amazon profitable in the future. Amazon sets up the future monetization of its streaming services by first using it as a “free” way to get people through the door and hooked on its perks. When we look at the favorability of features people would pay more for, it's all over the place. Of course, shopping and consumption features come in high, followed by streaming services. But there's a big dip in willingness to pay when it comes to core services like two-day shipping. Something that was revolutionary when launched is now table stakes for Amazon. There are also perks with less perceived value, such as Amazon Dash, a Wi-Fi connected device that reorders common items at the press of a button. While Amazon offers a few services that customers just don't seem to gravitate to, there are a number of new opportunities that customers would find useful, such as Prime Early Access, which gives members a head start on the site's lightning offers. It's a great case study in recognizing cues to differentiate customer segments. It's obvious that customers would latch onto membership options that feature these kinds of concierge, premium features — and others — for an additional fee. Who's primed to pay more for Prime services? 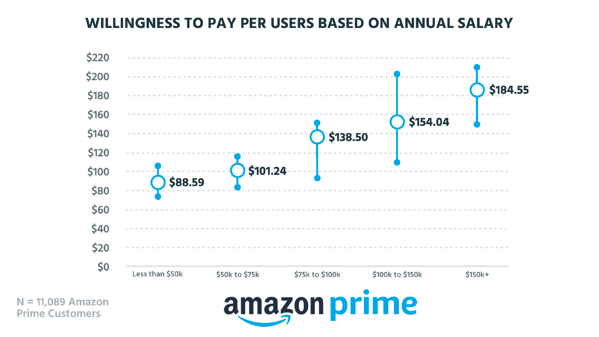 While Amazon has done a great job of setting customers up to feel receptive to increasing membership costs, not all member segments view price hikes equally. 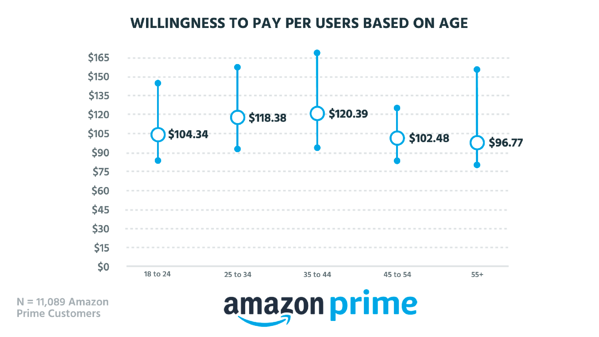 Most people are willing to pay $99 to $120 for Amazon Prime, but low-income members and those over the age 45 wouldn't be happy about anything higher than that. 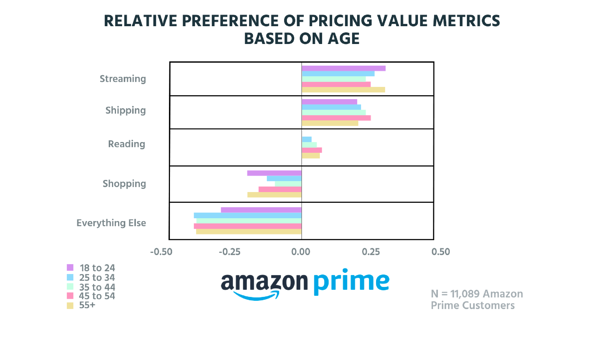 The majority of Prime's adult customers already view the $120 annual cost as reasonable; however, the brackets of 45- to 54-year-olds and 55-years-old and over don't share this view, showing they would prefer to see Amazon adjust pricing down, closer to $100 per year. But Amazon represents a weird phenomenon among consumer products that there are really only three tiers of products in the $100–$200 range: You're either a $100 product, a $150 product, or a $200 product. That means that if you charge $120 for something, consumers weigh that expense as they would if it cost $150, and a $170 expense would be weighed the same as a $200 expense. While many consumers value Prime as a Netflix with shopping and groceries added on, Amazon would likely face hard resistance and a loss of consumer confidence as the result of a price hike of 50% for the general membership. Instead, we would bet that Amazon will go higher for some membership options but will move in the direction of different Prime tiers rather than raise the price on one general membership. The call for segmented membership options comes from the deep divide that appears once we look at the willingness to pay per user, based on annual salary. This divide shows a strong argument for raising prices and a strong case for creating premium options. On one end of the spectrum, consumers who make more than $75k a year would go up to $200 a year for Prime, if given additional concierge features and access. But in Amazon's quest to be everything, including Walmart, they need to keep in mind the spending point of lower-income, entry-level members. In order to retain these key customers, Amazon should keep a more economical Prime package available for those members who really have to budget the expense. It's no secret that Amazon has done an impressive job of making customers rely on and feel loyal to Prime for a variety of services, from quick, free shipping to streaming services to consumable products. The success they've garnered by prioritizing customer satisfaction and focusing on what members want most stands out as an example for any business looking to transition from a simple pricing model to a strategy focused on pricing segmentation. By understanding buyer personas, any company can harness the strategy Amazon has laid out with Prime to create long-lasting loyalty that withstands price increases.